Last night’s UFC 234 main event was noticeably lacking in terms of having a hometown champ defend his belt against a dangerous challenger. However, what it did have was ultra-hot rising star Israel Adesanya trying out his next-level striking skills against the man who first introduced the world to next-level striking skills: Anderson Silva. And thankfully, Adesanya let Silva bang, bro. For three rounds, Adesanya danced, flicked out strikes at improbable angles, and scored points. But for three rounds, the former champ did the same, and though he was noticeably a step behind and a bit slower, he scored here and there. It was actually quiet thrilling to see a younger version of Silva in the cage against the older version. We so rarely get to see our old heroes go out gracefully. They usually get brutally maimed and murdered by the next generation hungry for blood. So it was cool to see Silva do his thing, and come away with just some dings and bruises. The post UFC 234 Results: Adesanya Wins, But Lets Anderson Silva Bang, Bro appeared first on Caged Insider. 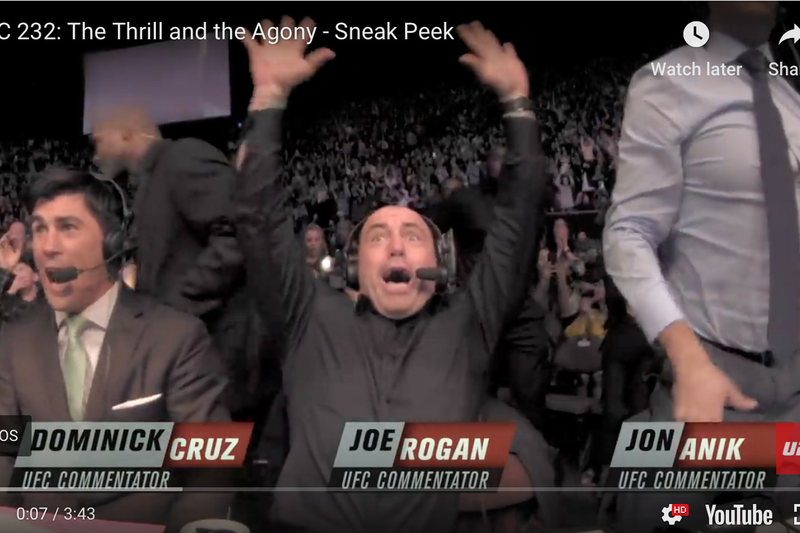 Ultimate Fighting Championship (UFC) color commentator, Joe Rogan, is passionate about combat sports, which is what makes his reactions to some of the greatest finishes in mixed martial arts (MMA) all the more enjoyable. They also get repeated ad nauseam in the UFC promo videos, but we can’t blame that on Rogan, who had one of his vintage freak outs when Amanda Nunes stopped Cristiane Justino in the UFC 232 pay-per-view (PPV) co-main event. Already the bantamweight titleholder, Nunes became the first women’s “champ-champ” and did so with a violent, first-round knockout. It was the first time the featherweight “Cyborg” has ever been put down with strikes in her 18-year career. No telling what’s next for either fighter, but all we can do is hope that Rogan is there to call the action, though with his PPV-only schedule, that might not happen until UFC 234 next month in Australia. Former professional MMA fighter Sharice Davids has made United States history as the first openly gay Native American woman to be elected to the United States House of Representatives. A Democrat, she came from behind to win against an incumbent in Republican-leaning Kansas, and joins former professional fighter Markwayne Mullin of Oklahoma as former MMA fighters who serve in Congress. Davids has spoken out in support of Leslie Smith and Project Spearhead, the attempt to unionize UFC fighters. She is a graduate of Cornell University, a lawyer and a former White House fellow. Her election comes as Democrats have flipped control of the House for the first time in nearly a decade. Over 100 women have been elected to Congress in the process, an all-time high. Davids’ MMA career has taken her from Team Bombsquad in NY, where she trained alongside a young Jon Jones, to Jackson-Winklejohn in New Mexico, where she trained for The Ultimate Fighter tryouts. While she didn’t make the cut to get onto the show, she did tap current UFC fighter Nina Ansaroff. She had two professional bouts, in 2013 and 2014. She told MMAFighting.com that her MMA career heavily influenced her political career. “For me, it impacts every facet of my life,” Davids said. “From my ability in staying calm — and it’s not to say I don’t get upset or any of that stuff. But I do think that like when you spend a while bunch of time literally getting punched, if you get angry every time you get punched, you’re not gonna last that long, because you’re gonna get burnt out. UFC 232 is looking stacked with the addition of Chad Mendes vs. Alex Volkanovski. Paul Felder vs. James Vick is a great fight and one that will see both men cut a lot of weight. Great return fight for VanZant. Barclays center here we come. I told y’all you would like it. January 19th is that day. And it will be my first time in Brooklyn NY. I am so excited for this one. Tickets Go on Sale Nov. 30th! Thank you all for the love and support. Rachael Ostovich-Berdon vs. Paige VanZant will look nothing like Ostovich sparring her mother. Daniel Cormier is just doing his part to destroy toxic masculinity in his Joe Rogan interviews. First the crying, now kissing. This is interesting- boxing referees apparently don’t like superman punches. Ben Askren knows about long flights to Asia and he’s trying to impart that knowledge to free agent Sage Northcutt. A back and forth war between two roided up Muay Thai fighters? Fantastic. This was funny- Tenshin Nasukawa respectfully offered to avenge McGregor’s loss to Mayweather and also informed the Irishman that he is not, in fact, Jackie Chan. Tony Ferguson is still targeting Khabib Nurmagomedov and his undefeated record. If you are wondering how Israel Adesanya’s takedown defense keeps getting better, Luke Thomas did a decent job explaining it. Dustin Poirier seems like a great dad.